This article is about the early Christian group. For the gospel associated with them, see Gospel of the Ebionites. Ebionites (Greek: Ἐβιωναῖοι, Ebionaioi, derived from Hebrew אביונים ebyonim, ebionim, meaning "the poor" or "poor ones") is a patristic term referring to a Jewish Christian movement that existed during the early centuries of the Christian Era. They regarded Jesus of Nazareth as the Messiah while rejecting his divinity and his virgin birth and insisted on the necessity of following Jewish law and rites. They used only one of the Jewish–Christian gospels, the Hebrew Book of Matthew starting at chapter three; revered James, the brother of Jesus (James the Just); and rejected Paul the Apostle as an apostate from the Law. Their name suggests that they placed a special value on voluntary poverty. Ebionim was one of the terms used by the sect at Qumran who sought to separate themselves from the corruption of the Temple. Many believe that the Qumran sectarians were Essenes. Since historical records by the Ebionites are scarce, fragmentary and disputed, much of what is known or conjectured about the Ebionites derives from the Church Fathers who wrote polemics against the Ebionites, who they deemed heretical Judaizers. Consequently, very little about the Ebionite sect or sects is known with certainty, and most, if not all, statements about them are conjectural. At least one scholar distinguishes the Ebionites from other Jewish Christian groups, such as the Nazarenes. Other scholars, like the Church Fathers themselves from the first centuries after Jesus, consider the Ebionites identical with the Nazarenes. The term Ebionites derives from the common adjective for "poor" in Hebrew (singular: אֶבְיוֹן ev·yōn, plural: אביונים ev·yōn·im), which occurs fifteen times in the Psalms and was the self-given term of some pious Jewish circles (e.g. Psalm 69:33 ("For the LORD heareth the poor") and 1 QpHab XII, 3.6.10). The term "Ebionim" was also a self description given by the people who were living in Qumran, as shown in the Dead Sea Scrolls. The term "the poor" was at first a common designation for all Christians, a reference to their material and voluntary poverty. The hellenized Hebrew term "Ebionite" (Ebionai) was first applied by Irenaeus in the second century without making mention of Nazarenes (c.180 CE). Origen wrote "for Ebion signifies 'poor' among the Jews, and those Jews who have received Jesus as Christ are called by the name of Ebionites." Tertullian was the first to write against a heresiarch called Ebion; scholars believe he derived this name from a literal reading of Ebionaioi as "followers of Ebion", a derivation now considered mistaken for lack of any more substantial references to such a figure. The term "the poor" (Greek ptōkhoí) was still used in its original, more general sense. Modern Hebrew still uses the Biblical Hebrew term "the needy" both in histories of Christianity for "Ebionites" (אביונים) and for almsgiving to the needy at Purim. The earliest reference to a group that might fit the description of the later Ebionites appears in Justin Martyr's Dialogue with Trypho (c. 140). Justin distinguishes between Jewish Christians who observe the Law of Moses but do not require its observance upon others and those who believe the Mosaic Law to be obligatory on all. Irenaeus (c. 180) was probably the first to use the term "Ebionites" to describe a heretical judaizing sect, which he regarded as stubbornly clinging to the Law. Origen (c. 212) remarks that the name derives from the Hebrew word "evyon," meaning "poor." Epiphanius of Salamis (c. 310–320 – 403) gives the most complete account in his heresiology called Panarion, denouncing eighty heretical sects, among them the Ebionites. Epiphanius mostly gives general descriptions of their religious beliefs and includes quotations from their gospels, which have not survived. According to the Encyclopædia Britannica, the Ebionite movement "may have arisen about the time of the destruction of the Jewish Temple in Jerusalem (AD 70)." The tentative dating of the origins of this sect depends on Epiphanius writing three centuries later and relying on information for the Ebionites from the Book of Elchasai, which may not have had anything to do with the Ebionites. Paul talks of his collection for the "poor among the saints" in the Jerusalem church, but this is generally taken as meaning the poorer members of the church rather than a schismatic group. The actual number of groups described as Ebionites is difficult to ascertain, as the contradictory patristic accounts in their attempt to distinguish various sects sometimes confuse them with each other. Other groups mentioned are the Carpocratians, the Cerinthians, the Elcesaites, the fourth century Nazarenes and the Sampsaeans, most of whom were Jewish Christian sects who held gnostic or other views rejected by the Ebionites. Epiphanius, however, mentions that a group of Ebionites came to embrace some of these views despite keeping their name. As the Ebionites are first mentioned as such in the second century, their earlier history and any relation to the first Jerusalem church remains obscure and a matter of contention. There is no evidence linking the origin of the later sect of the Ebionites with the First Jewish-Roman War of 66–70 CE or with the Jerusalem church led by James. Eusebius relates a tradition, probably based on Aristo of Pella, that the early Christians left Jerusalem just prior to the war and fled to Pella beyond the Jordan River, but does not connect this with Ebionites. They were led by Simeon of Jerusalem (d. 107) and during the Second Jewish-Roman War of 115–117, they were persecuted by the Jewish followers of Bar Kochba for refusing to recognize his messianic claims. Map of the Decapolis showing the location of Pella. According to Harnack, the influence of Elchasaites places some Ebionites in the context of the gnostic movements widespread in Syria and the lands to the east. After the end of the First Jewish–Roman War, the importance of the Jerusalem church began to fade. Jewish Christianity became dispersed throughout the Jewish diaspora in the Levant, where it was slowly eclipsed by gentile Christianity, which then spread throughout the Roman Empire without competition from "judaizing" Christian groups. Once the Jerusalem church was eliminated during the Bar Kokhba revolt in 135, the Ebionites gradually lost influence and followers. According to Hyam Maccoby (1987), their decline was due to marginalization and "persecution" by both Jews and Christians. Following the defeat of the rebellion and the expulsion of all Jews from Judea, Jerusalem became the Gentile city of Aelia Capitolina. Many of the Jewish Christians residing at Pella renounced their Jewish practices at this time and joined to the mainstream Christian church. Those who remained at Pella and continued in obedience to the Law were deemed heretics. In 375, Epiphanius records the settlement of Ebionites on Cyprus, but by the fifth century, Theodoret of Cyrrhus reported that they were no longer present in the region. 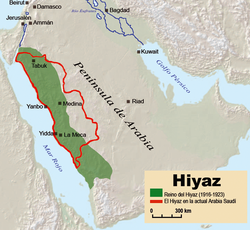 Map showing the historic region of Hejaz, shaded green (current division outlined in red). Some scholars argue that the Ebionites survived much longer and identify them with a sect encountered by the historian Abd al-Jabbar ibn Ahmad around the year 1000. There is another possible reference to Ebionite communities existing around the 11th century in northwestern Arabia in Sefer Ha'masaot, the "Book of the Travels" of Rabbi Benjamin of Tudela, a rabbi from Spain. These communities were located in two cities, Tayma and "Tilmas", possibly Sa`dah in Yemen. The 12th century Muslim historian Muhammad al-Shahrastani mentions Jews living in nearby Medina and Hejaz who accepted Jesus as a prophetic figure and followed traditional Judaism, rejecting mainstream Christian views. Some scholars argue that they contributed to the development of the Islamic view of Jesus due to exchanges of Ebionite remnants with the first Muslims. Most patristic sources portray the Ebionites as traditional Jews who zealously followed the Law of Moses, revered Jerusalem as the holiest city and restricted table fellowship only to Gentiles who converted to Judaism. Some Church Fathers describe some Ebionites as departing from traditional Jewish principles of faith and practice. For example, Epiphanius of Salamis stated that the Ebionites engaged in excessive ritual bathing, possessed an angelology which claimed that the Christ is a great archangel who was incarnated in Jesus and adopted as the son of God, opposed animal sacrifice, denied parts or most of the Law, practiced Jewish vegetarianism and celebrated a commemorative meal annually on or around Passover with unleavened bread and water only, in contrast to the daily Christian Eucharist. The reliability of Epiphanius' account of the Ebionites is questioned by some scholars. Shlomo Pines, for example, argues that the heterodox views and practices he ascribes to some Ebionites originated in Gnostic Christianity rather than Jewish Christianity and are characteristics of the Elcesaite sect, which Epiphanius mistakenly attributed to the Ebionites. Another Church Father who described the Ebionites as departing from Christian orthodoxy was Methodius of Olympus, who stated that the Ebionites believed that the prophets spoke only by their own power and not by the power of the Holy Spirit. While mainstream biblical scholars do suppose some Essene influence on the nascent Jewish-Christian Church in some organizational, administrative and cultic respects, some scholars go beyond that assumption. Regarding the Ebionites specifically, a number of scholars have different theories on how the Ebionites may have developed from an Essene Jewish messianic sect. Hans-Joachim Schoeps argues that the conversion of some Essenes to Jewish Christianity after the Siege of Jerusalem in 70 CE may be the source of some Ebionites adopting Essene views and practices, while some conclude that the Essenes did not become Jewish Christians, but still had an influence on the Ebionites. Epiphanius of Salamis, in his book Panarion, 30:17:5, said, "But I already showed above that Ebion did not know these things, but later, his followers that associated with Elchasai had the circumcision, the Sabbath and the customs of Ebion, but the imagination of Elchasai." Epiphanius made it clear that the original Ebionites were different from those heterodox Ebionites that he described. Robert Eisenman suggests that the Ebonim followed the Nazirite Oath that was associated with "James the brother of Jesus"
The majority of Church Fathers agree that the Ebionites rejected many of the precepts central to Nicene orthodoxy, such as Jesus' pre-existence, divinity, virgin birth, atoning death and physical resurrection. On the other hand, an Ebionite story has Jesus eating bread with his brother, Jacob ("James the Just"), after the resurrection, which indicates that the Ebionites, or at least the ones who accepted this version of the Gospel of the Hebrews, believed in a physical resurrection of Jesus. The Ebionites are described as emphasizing the oneness of God and the humanity of Jesus as the biological son of Mary and Joseph, who by virtue of his righteousness was chosen by God to be the messianic "prophet like Moses" (foretold in Deuteronomy 18:14–22) when he was anointed with the Holy Spirit at his baptism. Origen (Contra Celsum 5.61) and Eusebius (Historia Ecclesiastica 3.27.3) recognize some variation in the Christology of Ebionite groups; for example, that while all Ebionites denied Jesus' pre-existence, there was a sub-group which did not deny the virgin birth. Theodoret, while dependent on earlier writers, draws the conclusion that the two sub-groups would have used different Gospels. Of the books of the New Testament, the Ebionites are said to have accepted only a Hebrew (or Aramaic) version of the Gospel of Matthew, referred to as the Gospel of the Hebrews, as additional scripture to the Hebrew Bible. This version of Matthew, Irenaeus reports, omitted the first two chapters (on the nativity of Jesus) and started with the baptism of Jesus by John the Baptist. The Ebionites believed that all Jews and Gentiles must observe the commandments in the Law of Moses in order to become righteous and seek communion with God. One of the popular primary connections of the Ebionites to James is that noted by William Whiston in his edition of Josephus (1794), where he notes regarding the murder of James, the brother of Jesus, "we must remember what we learn from the Ebionite fragments of Hegesippus, that these Ebionites interpreted a prophecy of Isaiah as foretelling this very murder." That Hegesippus made this connection from Isaiah is undisputed; however, Whiston's identification of Hegesippus as an Ebionite, while common in 18th and 19th century scholarship, is debatable. The other popularly proposed connection is that the Ascents of James in the Pseudo-Clementine literature are related to the Ebionites. The Book of Acts begins by showing Peter as leader of the Jerusalem church, the only church in existence immediately after the ascension, though several years later, Paul lists James prior to "Cephas" (Peter) and John as those considered "pillars" (Greek styloi) of the Jerusalem Church. Eusebius records that Clement of Alexandria wrote that Peter, James and John chose James, the brother of Jesus, as bishop of Jerusalem, but Eusebius also subjects James to the authority of all the apostles. Peter baptised Cornelius the Centurion, introducing uncircumcised Gentiles into the church in Judea. Paul, Apostle to the Gentiles, established many churches and developed a Christian theology (see Pauline Christianity). At the Council of Jerusalem (c 49), Paul argued to abrogate Mosaic observances for non-Jewish converts. When Paul recounted the events to the Galatians (Galatians 2:9-10), he referred only to the remembrance of the poor rather than conveying the four points of the Council of Jerusalem (Acts 15:19-21). James Dunn notes the conciliatory role of James as depicted in Acts in the tension between Paul and those urging the Law of Moses upon Gentiles. According to Eusebius, the Jerusalem church fled to Pella, Jordan after the death of James to escape the siege of the future Emperor Titus. After the Bar Kokhba revolt, the Jerusalem church was permitted to remain in the renamed Aelia Capitolina, but notably from this point onward all bishops of Jerusalem bear Greek rather than evidently Jewish names. Scholars such as Pierre-Antoine Bernheim, Robert Eisenman, Will Durant, Michael Goulder, Gerd Ludemann, John Painter and James Tabor argue for some form of continuity of the Jewish Jerusalem church into the second and third centuries and that the Ebionites regarded James, the brother of Jesus, as their leader. Scholars, including Richard Bauckham, distinguish the high Christology practiced by the Jerusalem church under James with the low Christology later adopted by the Ebionites. Tabor argues that the Ebionites claimed a dynastic apostolic succession for the relatives of Jesus. Epiphanius relates that the Ebionites opposed the Apostle Paul, who they saw as responsible for the idea that gentile Christians did not have to be circumcised or follow the Law of Moses, and named him an apostate. Epiphanius further relates that some Ebionites alleged that Paul was a Greek who converted to Judaism in order to marry the daughter of a high priest of Israel, but apostatized when she rejected him. As an alternative to the traditional view of Eusebius that the Jerusalem church simply became integrated with the Gentile church, other scholars, such as Richard Bauckham, suggest immediate successors to the Jerusalem church under James and the relatives of Jesus were the Nazoraeans who accepted Paul, while the Ebionites were a later offshoot of the early second century. Few writings of the Ebionites have survived and they are in uncertain form. The Recognitions of Clement and the Clementine Homilies, two third century Christian works, are regarded by general scholarly consensus as largely or entirely Jewish Christian in origin and reflect Jewish Christian beliefs. The exact relationship between the Ebionites and these writings is debated, but Epiphanius's description of some Ebionites in Panarion 30 bears a striking similarity to the ideas in the Recognitions and Homilies. Scholar Glenn Alan Koch speculates that Epiphanius likely relied upon a version of the Homilies as a source document. Some scholars also speculate that the core of the Gospel of Barnabas, beneath a polemical medieval Muslim overlay, may have been based upon an Ebionite or gnostic document. The existence and origin of this source continues to be debated by scholars. John Arendzen (Catholic Encyclopedia article "Ebionites" 1909) classifies the Ebionite writings into four groups. Irenaeus stated that the Ebionites used Matthew's Gospel exclusively. Eusebius of Caesarea wrote that they used only the Gospel of the Hebrews. From this, the minority view of James R. Edwards (2009) and Bodley's Librarian Edward Nicholson (1879) claim that there was only one Hebrew gospel in circulation, Matthew's Gospel of the Hebrews. They also note that the title Gospel of the Ebionites was never used by anyone in the early Church. Epiphanius contended that the gospel the Ebionites used was written by Matthew and called the Gospel of the Hebrews. Because Epiphanius said that it was "not wholly complete, but falsified and mutilated", writers such as Walter Richard Cassels (1877) and Pierson Parker (1940) consider it a different "edition" of Matthew's Hebrew Gospel; however, internal evidence from the quotations in Panarion 30.13.4 and 30.13.7 suggest that the text was a Gospel harmony originally composed in Greek. Mainstream scholarly texts, such as the standard edition of the New Testament Apocrypha edited by Wilhelm Schneemelcher, generally refer to the text Jerome cites as used by the Ebionites as the Gospel of the Ebionites, though this is not a term current in the Early Church. The collection of New Testament apocrypha known as the Clementine literature included three works known in antiquity as the Circuits of Peter, the Acts of the Apostles and a work usually titled the Ascents of James. They are specifically referenced by Epiphanius in his polemic against the Ebionites. The first-named books are substantially contained in the Homilies of Clement under the title of Clement's Compendium of Peter's itinerary sermons and in the Recognitions attributed to Clement. They form an early Christian didactic fiction to express Jewish Christian views, such as the primacy of James, the brother of Jesus; their connection with the episcopal see of Rome; and their antagonism to Simon Magus, as well as gnostic doctrines. Scholar Robert E. Van Voorst opines of the Ascents of James (R 1.33–71), "There is, in fact, no section of the Clementine literature about whose origin in Jewish Christianity one may be more certain". Despite this assertion, he expresses reservations that the material is genuinely Ebionite in origin. Symmachus produced a translation of the Hebrew Bible in Koine Greek, which was used by Jerome and is still extant in fragments, and his lost Hypomnemata, written to counter the canonical Gospel of Matthew. Although lost, the Hypomnemata is probably identical to De distinctione præceptorum mentioned by Ebed Jesu (Assemani, Bibl. Or., III, 1). The identity of Symmachus as an Ebionite has been questioned in recent scholarship. Hippolytus of Rome (c.230) reported that a Jewish Christian, Alcibiades of Apamea, appeared in Rome teaching from a book which he claimed to be the revelation which a righteous man, Elkesai, had received from an angel, though Hippolytus suspected that Alcibiades was himself the author. Shortly afterwards, Origen recorded a group, the Elkesaites, with the same beliefs. Epiphanius claimed the Ebionites also used this book as a source for some of their beliefs and practices (Panarion 30.17). Epiphanius explains the origin of the name Elkesai to be Aramaic El Ksai, meaning "hidden power" (Panarion 19.2.1). Scholar Petri Luomanen believes the book to have been written originally in Aramaic as a Jewish apocalypse, probably in Babylonia in 116-117. The mainstream Christian view of the Ebionites is partly based on interpretation of the polemical views of the Church Fathers who portrayed them as heretics for rejecting many of the central Christian views of Jesus and allegedly having an improper fixation on the Law of Moses at the expense of the grace of God. In this view, the Ebionites may have been the descendants of a Jewish Christian sect within the early Jerusalem church which broke away from its mainstream theology. The counter-missionary group Jews for Judaism favorably mentions the historical Ebionites in their literature in order to argue that "Messianic Judaism", as promoted by missionary groups such as Jews for Jesus, is Pauline Christianity misrepresenting itself as Judaism. Some Messianic groups have expressed concern over leaders in Israel who deny Jesus' divinity and the possible collapse of the Messianic movement due to a resurgence of Ebionitism. In a 2007 polemic, a Messianic writer asked whether Christians should imitate the Torah observance and acceptance of rabbinic understanding of "neo-Ebionites", who are defined as those who accept Jesus as Messiah, reject Paul and claim Moses as the only guide for Christians. Islam charges Christianity with having distorted the pure monotheism of Jesus through the doctrines of the Trinity and through the veneration of icons. Paul Addae and Tim Bowes (1998) write that the Ebionites were faithful to the original teachings of Jesus and thus shared Islamic views about Jesus' humanity and also rejected the redemptive death, though the Islamic view of Jesus may conflict with the view of some Ebionites regarding the virgin birth, respectively denying and affirming, according to Epiphanius. One of the first men to believe in the prophethood of Muhammad was possibly an Ebionite (sometimes argued to be Nestorian) monk named Waraqah ibn Nawfal, the cousin of Mohammed's wife Khadija, who Muslims honor as a pious man with deep knowledge of the Christian scriptures. Hans Joachim Schoeps observes that the Christianity Muhammad was likely to have encountered on the Arabian peninsula "was not the state religion of Byzantium but a schismatic Christianity characterized by Ebionite and Monophysite views." ^ Church Fathers on the Ebionites (Wikisource). ^ a b Hegg, Tim (2007). "The Virgin Birth — An Inquiry into the Biblical Doctrine" (PDF). TorahResource. Retrieved 13 August 2007. ^ a b c d e G. Uhlhorn, "Ebionites", in: A Religious Encyclopaedia or Dictionary of Biblical, Historical, Doctrinal, and Practical Theology, 3rd ed. (edited by Philip Schaff), p. 684–685 (vol. 2). ^ a b c d e f g O. Cullmann, "Ebioniten", in: Religion in Geschichte und Gegenwart, p. 7435 (vol. 2). ^ Minucius Felix, Octavius, 36: "That we are called the poor is not our disgrace, but our glory." ^ The Greek equivalent πτωχοί) ptōkhoí appears in the New Testament (Romans 15, 26; Galatians 2,10), possibly as an honorary title of the Jerusalem Church. ^ Antti Marjanen, Petri Luomanen "A companion to second-century Christian "heretics" p250 "It is interesting to note that the Ebionites first appear in the catalogues in the latter half of the second century. The earliest reference to the Ebionites was included in a catalogue used by Irenaeus in his Refutation and Subversion ..."
^ Eerdmans Dictionary of the Bible 2000 p364 "EBIONITES Name for Jewish Christians first witnessed in Irenaeus (Adv. haer. 1.26.2; Gk. ebionaioi) ca. 180 ce"
^ Origen, Contra Celsum, II, 1. ^ The Oxford English-Hebrew Dictionary 9780198601722. ^ a b c Justin Martyr, Dialogue with Trypho, 47. ^ a b c d Irenaeus of Lyon, Adversus Haereses I, 26; III,21. ^ Origen, De Principiis, IV, 22. ^ a b Epiphanius of Salamis, Panarion, 30. ^ a b c Glenn Alan Koch (1976). A Critical Investigation of Epiphanius' Knowledge of the Ebionites: A Translation and Critical Discussion of 'Panarion' 30. University of Pennsylvania. ^ Some scholars see the title present already in Paul's references to a collection for the "poor" in Jerusalem (Gal.1:10). But in Rom.15:26 Paul distinguishes this group from the other Jerusalem believers by speaking of "the poor among the saints." In 2 Cor.9:12 Paul further confirms the economic, or literal, aspect by speaking of the collection as making up for "the deficiencies of the saints". E. Stanley Jones, '"Ebionites", in Eerdmans Dictionary of the Bible, Amsterdam University Press, 2000 p.364. ^ a b c Henry Wace & William Piercy (1911). A Dictionary of Early Christian Biography. Retrieved 1 August 2007. ^ Adolf von Harnack, The History of Dogma, "Chapter VI. The Christianity of the Jewish Christians", 1907, ISBN 978-1-57910-067-4. ^ Edward Gibbon (2003). The Decline and Fall of the Roman Empire, ch. 15, p. 390–391. Random House, NY. ISBN 0-375-75811-9. Chapter 15. Archived from the original on 6 September 2007. Retrieved 2 August 2007. ^ a b c Shlomo Pines (1966). The Jewish Christians Of The Early Centuries Of Christianity According To A New Source. Proceedings of the Israel Academy of Sciences and Humanities II, No. 13. OCLC 13610178. ^ Marcus N. Adler (1907). The Itinerary of Benjamin of Tudela: Critical Text, Translation and Commentary. Phillip Feldheim. pp. 70–72. ^ Muhammad al-Shahrastani (2002). The Book of Religious and Philosophical Sects, William Cureton edition. Gorgias Press. p. 167. ^ a b Epiphanius, Panarion, 30, 16, 4-5. ^ W.M. Ramsey (1912). "The Tekmoreian Guest-Friends". Journal of Hellenic Studies. 32: 151–170. doi:10.2307/624138. JSTOR 624138. ^ Exarch Anthony J. Aneed (1919). "Syrian Christians, A Brief History of the Catholic Church of St. George in Milwaukee, Wis. And a Sketch of the Eastern Church". Archived from the original on 17 April 2007. Retrieved 28 April 2007. ^ Irenaeus of Lyon, Against Heresies V, 1. ^ a b Robert E. van Voorst (1989). The Ascents of James: History and Theology of a Jewish-Christian Community. Society of Biblical Literature. ISBN 1-55540-294-1. ^ Thomas C. Oden (2006). Ancient Christian commentary on Scripture: New Testament. InterVarsity Press. pp. 178–. ISBN 978-0-8308-1497-8. Retrieved 14 October 2010. excerpt from St. Methodius of Olympus, Symposium on Virginity, 8.10., "and with regard to the Spirit, such as the Ebionites, who contend that the prophets spoke only by their own power"
^ J Verheyden, Epiphanius on the Ebionites, in The image of the Judaeo-Christians in ancient Jewish and Christian literature, eds Peter J. Tomson, Doris Lambers-Petry, ISBN 3-16-148094-5, pp. 188 "The vegetarianism of John the Baptist and of Jesus is an important issue too in the Ebionite interpretation of the Christian life. " ^ Bart D. Ehrman (2003). Lost Christianities: The Battles for Scripture and the Faiths We Never Knew. Oxford University Press. pp. 102, 103. ISBN 0-19-514183-0. p.102 - "Probably the most interesting of the changes from the familiar New Testament accounts of Jesus comes in the Gospel of the Ebionites description of John the Baptist, who, evidently, like his successor Jesus, maintained a strictly vegetarian cuisine." ^ Bart D. Ehrman (2003). Lost Scriptures: Books that Did Not Make It into the New Testament. Oxford University Press. p. 13. ISBN 0-19-514182-2. p.13 - Referring to Epiphanius' quotation from the Gospel of the Ebionites in Panarion 30.13, "And his food, it says, was wild honey whose taste was of manna, as cake in oil". ^ Textual Apparatus of the UBS Greek New Testament United Bible Societies 1993 - with Peshitta, Old Latin etc. ^ G.R.S. Mead (2007). Gnostic John the Baptizer: Selections from the Mandæan John-Book. Forgotten Books. p. 104. ISBN 978-1-60506-210-5. p.104 - "And when he had been brought to Archelaus and the doctors of the Law had assembled, they asked him who he is and where he has been until then. And to this he made answer and spake: I am pure; [for] the Spirit of God hath led me on, and [I live on] cane and roots and tree-food." ^ Eisenman, Robert (2002), "James, the brother of Jesus." ^ Gospel of the Hebrews as quoted by Hieronymus (Jerome) in On Illustrious Men, 2. ^ Schaff A select library of Nicene and post-Nicene fathers of the Christian church 1904 footnote 828 "That there were two different views among the Ebionites as to the birth of Christ is stated frequently by Origen (cf. e.g. Contra Celsum V. 61), but there was unanimity in the denial of his pre-existence and essential divinity, and this constituted the essence of the heresy in the eyes of the Fathers from Irenæus on." ^ Albertus Frederik Johannes Klijn, G. J. Reinink Patristic evidence for Jewish-Christian sects 1973 p42 "Irenaeus wrote that these Ebionites used the Gospel of Matthew, which explains Theodoret's remark. Unlike Eusebius, he did not link Irenaeus' reference to Matthew with Origen's remarks about the "Gospel of the Hebrews","
^ Edwin K. Broadhead Jewish Ways of Following Jesus: Redrawing the Religious Map of Antiquity 2010 p209 "Theodoret describes two groups of Ebionites on the basis of their view of the virgin birth. Those who deny the virgin birth use the Gospel of the Hebrews; those who accept it use the Gospel of Matthew." ^ James the Just and Christian origins p217 Bruce Chilton, Craig A. Evans - 1999 "Isaiah 3:10 in its context expresses the link between the martyrdom of James and the fall of Jerusalem which the common source used by Hegesippus and the Second Apocalypse of James stressed "
^ Henry Clay Sheldon -History of Christian Doctrine 1895 "But it is by no means clear that Hegesippus was an Ebionite. His description of James the Just scarcely goes further toward proving him an Ebionite than it does toward proving the same of Eusebius, who not only quotes his description..."
^ Frank J. Matera Galatians 2007 p77 "Here, Paul probably understands that James, Cephas, and John were considered to be pillars (styloi) of the Church." ^ John Painter, Just James (2005), p274: "Eusebius reported that Clement of Alexandria wrote that, after the ascension, Peter, James, and John chose James the Just as bishop of Jerusalem, although another quotation in Eusebius implies James's leadership from the time of the resurrection. Eusebius subjects James to the authority of all the apostles in a way that provides evidence of a struggle between the Great Church, represented here by the apostles and the independent authority of James"
^ Jesus in context: Temple, purity, and restoration Bruce Chilton, Craig A. Evans - 1997 p12 "Peter defends his baptisms in the house of Cornelius on the basis of his vision in the course of a dispute with..."
^ James D. G. Dunn Beginning from Jerusalem 2009 p1083 "This James is a much more conciliatory figure than he is usually thought to be." ^ "The Christian Community of Aelia Capitolina" in The Book of Acts in Its Palestinian Setting by Richard Bauckham. p310. ^ Pierre-Antoine Bernheim, James, Brother of Jesus, ISBN 978-0-334-02695-2 "The fact that he became the head of the Jerusalem church is something which is generally accepted." from an ABC interview with author. ^ Robert Eisenman (2006). The New Testament Code. Watkins Publishing. pp. 34, 145, 273. ISBN 978-1-84293-186-8. p.34 - "These "Ebionites" are also the followers of James par excellence, himself considered (even in early Christian accounts) to be the leader of "the Poor" or these selfsame "Ebionites""., p.145 - "For James 2:5, of course, it is "the Poor of this world ("the Ebionim" or "Ebionites") whom God chose as Heirs to the Kingdom He promised to those that love Him". ", p.273 - "..."the Righteous Teacher" and those of his followers (called "the Poor" or "Ebionim" - in our view, James and his Community, pointedly referred to in the early Church literature, as will by now have become crystal clear, as "the Ebionites" or "the Poor")." ^ Michael Goulder (1995). St. Paul versus St. Peter: A Tale of Two Missions. John Knox Press. pp. 107–113, 134. ISBN 0-664-25561-2. p.134 "So the 'Ebionite' Christology, which we found first described in Irenaeus about 180 is not the invention of the late second century. It was the creed of the Jerusalem Church from early times." ^ Gerd Ludemann (1996). Heretics: The Other Side of Early Christianity. John Knox Press. pp. 52–56. ISBN 0-664-22085-1. Retrieved 27 March 2011. p.52-53 "Since there is a good century between the end of the Jerusalem community and the writing down of the report quoted above (by Irenaeus), of course reasons must be given why the group of Ebionites should be seen as an offshoot of the Jerusalem community. The following considerations tell in favor of the historical plausibility of this: 1. The name 'Ebionites' might be the term this group used to denote themselves. 2. Hostility to Paul in the Christian sphere before 70 is attested above all in groups which come from Jerusalem. 3. The same is true of observance of the law cumulating in circumcision. 4. The direction of prayer towards Jerusalem makes the derivation of the Ebionites from there probable." p.56 - "therefore, it seems that we should conclude that Justin's Jewish Christians are a historical connecting link between the Jewish Christianity of Jerusalem before the year 70 and the Jewish Christian communities summed up in Irenaeus' account of the heretics." ^ John Painter (1999). Just James - The Brother of Jesus in History and Tradition. Fortress Press. pp. 83–102, 229. ISBN 0-8006-3169-2. p.229 "A connection between early Jerusalem Christianity (the Hebrews) and the later Ebionites is probable." ^ Bauckham ‘We may now assert quite confidently that the self-consciously low Christology of the later Jewish sect known as the Ebionites does not, as has sometimes been asserted, go back to James and his circle in the early Jerusalem church.’ Richard Bauckham, 'James and Jesus,' in Bruce Chilton, Jacob Neusner, The brother of Jesus: James the Just and his mission, Westminster John Knox Press, 2001, pp.100-137, p.135. ^ Tabor (2006), p. 4-5, 79-80, 247, 249-251. ^ Petri Luomanen (2007). Matt Jackson-McCabe (ed.). Jewish Christianity Reconsidered. Fortress Press. p. 88. ISBN 978-0-8006-3865-8. ^ Richard Bauckham (January 1996). "The Relatives of Jesus". Themelios. 21 (2): 18–21. Retrieved 11 February 2011. Reproduced in part by permission of the author. ^ John Toland, Nazarenus, or Jewish, Gentile and Mahometan Christianity, 1718. ^ Blackhirst, R. (2000). "Barnabas and the Gospels: Was There an Early Gospel of Barnabas?, Journal of Higher Criticism, 7/1, p. 1–22". Retrieved 11 March 2007. Herbermann, Charles, ed. (1913). "Ebionites" . Catholic Encyclopedia. New York: Robert Appleton Company. ^ Eusebius of Caesarea, Church History, III, 27, 4. ^ The Complete Gospels. Polebridge Press, Robert J. Miller ed. 1994. p. 436. ISBN 0-06-065587-9. ^ Robert Walter Funk, The Gospel of Jesus: according to the Jesus Seminar, Publisher Polebridge Press, 1999. ^ F.L. Cross and E.A. Livingston, The Oxford Dictionary of the Christian Church, 1989, Oxford University Press, p. 438 - 439. ^ Symmachus' Hypomnemata is mentioned by Eusebius in his Historia Ecclesiae, VI, xvii: "As to these translators it should be stated that Symmachus was an Ebionite. But the heresy of the Ebionites, as it is called, asserts that Christ was the son of Joseph and Mary, considering him a mere man, and insists strongly on keeping the law in a Jewish manner, as we have seen already in this history. Commentaries of Symmachus are still extant in which he appears to support this heresy by attacking the Gospel of Matthew. Origen states that he obtained these and other commentaries of Symmachus on the Scriptures from a certain Juliana, who, he says, received the books by inheritance from Symmachus himself. "; Jerome, De Viris Illustribus, chapter 54, Church History, VI, 17. ^ Jerome, De viris illustribus, 54. ^ Philosophumena, IX, 14-17. Luttikhuizen 1985 "Epiphanius deviates so strikingly from Hippolytus' account of the heresy of Alcibiades that we cannot possibly assume that he is dependent on the Refutation." ^ Epiphanius, Panarion, 19, 1; 53, 1. ^ Bentzion Kravitz (2001). The Jewish Response to Missionaries: Counter-Missionary Handbook. Jews for Judaism International. ^ Moshe Koniuchowsky (2007). ""Messianic" Leaders Deny Yeshua in Record Numbers". Archived from the original on 12 August 2007. Retrieved 21 July 2007. ^ James Prasch (2007). "You Foolish Galatians, Who Bewitched You? A Crisis in Messianic Judaism?". Archived from the original on 11 August 2004. Retrieved 21 July 2007. ^ John Parsons (2007). "Should Christians be Torah-observant?". Retrieved 21 July 2007. ^ Hans Joachim Schoeps, Jewish Christianity (Philadelphia: 1969), p. 137. G. Uhlhorn, "Ebionites", in: Philip Schaff (ed. ), A Religious Encyclopaedia or Dictionary of Biblical, Historical, Doctrinal, and Practical Theology, 3rd ed. (1894), p. 684–685 (vol. 2). Wilson, Barrie (2008). How Jesus Became Christian - The early Christians and the transformation of a Jewish teacher into the Son of God. Orion. ISBN 978-0-297-85200-1. Jeffrey Butz (2010). The Secret Legacy of Jesus. Inner Traditions. ISBN 978-1-59477-307-5. Goranson, Stephen. 'Ebionites," in D Freedman (ed. ), The Anchor Bible Dictionary (New York: Doubleday, 1992), vol. 2, pp. 260–1. Look up Ebionite in Wiktionary, the free dictionary. "Ebionites" . The American Cyclopædia. 1879.